Jaheira is multi-class, while any character have 2 columns (3 in fact as you can have 3 multi-class characters) characters with dual/multi class use 2 columns, one for each class. This means that probally when they made the .cha archives of jaheira, they probally configured Jaheira proficience with only 1 column for lazyness or another reason. After you evolve enough with both Jaheira classes, suffice to get an proficience point in each class, if this issue happens again, make another post. Then, i could be wrong and this can be another completly different issue ! Hmm, but ALL the NPCs are like this. I don't think they're all multi-class, are they? Say, Minsc? He's just an unkitted ranger, isn't he? But it probably is some kind of formatting thing. It doesn't seem to make any difference in the game - when I turn Minsc into a berserker and mod his proficiencies, as long as I do all that work in the "2nd class" column it all works just fine. Actually, multi-class characters don't get proficiencies from both classes, just the class with the greater proficiency progression. So, a Fighter/Thief starts with 4 proficiencies (from his/her Fighter class) and then gains a proficiency every 3rd Fighter level he/she gains. No proficiencies are gains from his/her Thief class. If a Druid/Thief were legal, it would be interesting from a proficiencies POV. It would start with 2 (both Druids and Thieves start with 2), gain another proficiency at Thief 4/Druid 3, then another at Thief 7/Druid 8, thanks to Druids accelerated level progression vs. Thieves past level 6, another at Thief 11/Druid 12, and then it reverses again at Thief 16/Druid 13. @troodon80 I'm pretty new to shadowkeeper so I was wondering if I could get a bit of help. I'm trying to edit the Staff of Striking to give it infinite/a lot of charges. Can this be done with EE Keeper and if so, how? Thanks in advance. Edit: Nevermind, methinks I've found it. Went to change item with it in my inventory, I hadn't seen that before. 1) I am trying to create a Halfling Fighter/Assassin... However, adding the assassin kit doesn't give me the +1 damage and +1 chance to hit, and innate abilities (Poison weapon) has to be added manually...? Is there a work around for this? What is the idea of adding a kit if kit bonusses doesn't apply??? 2) I would like to add a returning dagger +1, can't find one on the list, how to do it? Since it is the game that deals with this, that is the only option as of current. I might look into it in the future, but for now I'm trying to make sure EE Keeper is as stable as possible before adding much more in the way of features. You will have to know what the name of the dagger is, or use the search feature to find something with 'return' in the description (obviously disregarding items that are not weapons, and items that might have 'return' elsewhere in the description rather than under Combat Abilities - the list is usually rather short). BG2 has a few items that return to the wielders' hand (daggers, axes, etc. ), but BG appears to only have the Throwing Axe +2. If there is no +1 dagger that returns to the user in the game, then you won't be able to add one. @Cactus, multiclass Cleric/Thief seems to only allow one pip, and since Swashbuckler is just a thief kit that's probably all you'll be able to do. If you want to add three, then you will have to add them manually. Works like a charm on Steam version Had to copy and rename the executable file though. Thank you for your hard work. EEKeeper works very well with Baldur's Gate 2:ToB and both SoA, but you are not able to browse saved game nor CHR, because the directory's name is different (the game's data is in BG2 - SoA, and in BG:EE its in the folder Baldur's Gate Enhanced Edition) and so EEKeeper can't find saves and etc. If I rename BG2 - SoA to Baldur's Gate Enhanced Edition, saves and CHR could be browsed and edited, but I downloaded Near Infinity Editor to edit saves and CHR, also to create Spells and edit Items. I've been trying to make to make all of the NPCs into PCs using the EE Keeper, but I'm having trouble with their innate abilities. Brenwen, for example, has three daily uses of Spiritual Hammer. When I add the innate ability and set number it doesn't carry over into the game. Perhaps, this is due to not having innate abilities in the Memorization tab. Could you add those, please, or tell me the easiest way how to go about this? Thank you. @Jidokwon, I'll look into that. I seem to remember someone mentioned something in brief about this before. I was able to remake Brenwen as a PC using the console command AddSpell ("SPIN113") three times. It would be a nice feature to be able to add innates on the fly, however, using EE Keeper. Hopefully it won't require a lot of work to do this. Thanks anyhow and loving the updated Keeper. @Wiggles, we all have them from time to time. So how do you actually edit state flags? The only way I've found to fix this screwing up any characters who are dead is to clear them but NO WHERE ACTUALLY SAYS HOW. They just say to click to the right of them, which does nothing but deselect them. Am I missing something? I just want to be able to revive my party members, not use this and have it somehow make it so being raised just gives me glitchy statues that make me unable to save or leave the area. @xanthan, deselect states for characters who are dead, then save. Deselecting all states by clicking to the right is the easiest method - else you can hold the CTRL key and click - as with normal lists you'll find in other programs - on specific states in order to select or deselect only the states you want or don't want; this is handy if you have some other states such as Nondetection, etc., beneficial states. If you deselect the "Death" flags, the character - or characters - you edit that were previously dead will be alive when you load the edited game. Huh. I was expecting somekind of visual identifier beyond just them no longer being blue, ok then, thank you, guess I was overthinking it. @xanthan, don't worry about it. Any other questions you might have, feel free to ask. The link to downloading version 1.02 is inactive ? @xanthan, this is an update to your question. The next build will not have a 'State Flags' tab. I took a look at that tab today, and it turns out that only one state appears to be active at any given time. This means that having multiple states selected is more likely to screw something up. I've gotten rid of the 'State Flags' tab and replaced it with a drop down selection box. There shouldn't be any confusion over that. @Palanthis, that would be because I haven't uploaded it. It's going to be available once BG2 is released (hopefully). I've added the stuff about it so that when it is ready, all I have to do is edit in the link. Oh ok, this wasnt very clear from your first post, especially since an update note is already available. Thanks. But when I choose my Affects(example: No delay between casting spells and faster spell cast), Or to be more accurate when I edit my affects, It seems that randomly after I save or quickload a game the affects just vanish, Which I find annoying. Also do you have a solution for that? So yeah, Thanks for hearing me out! @Heas, that's probably something to do with the way the affect is handled; i.e. timed, permanent, while equipped, etc. When I update this again, I'll probably make the affects dialog box a little more user-friendly. how do i get eekeeper to find the bgee installation directory in windows 7 64 bit??? You'll have to browse for it. Once you find the BG:EE installation, you can enter it as is shown in the example image on the first page. It is in the second post on the first page, under the question "Q. EE Keeper says it can't load the strings, or says it's not the correct directory." Is anyone else running into this problem? 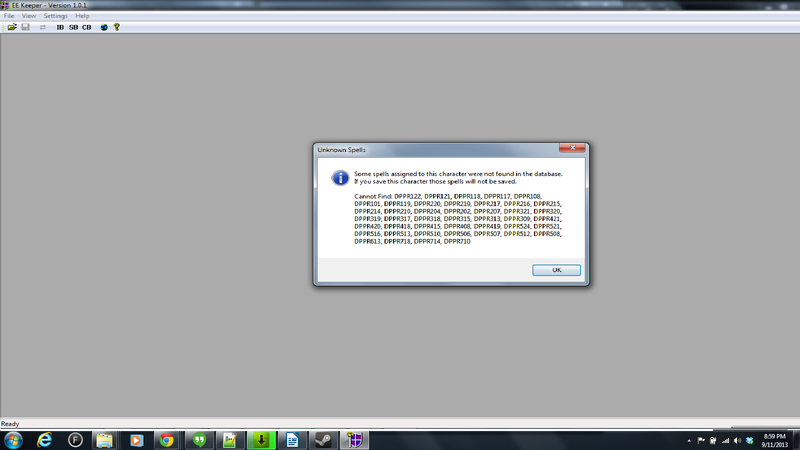 This is the result I get when I attempt to load a level one Undead Hunter character file. EE Keeper's not having any trouble finding the BGEE directories, as far as I can tell, and I'm not having any trouble with my Blackguard, Archer, Necromancer, or Cleric, so it's apparently just something about the Undead Hunter kit that it doesn't like. @Yinepuhotep, can you provide any other details? Do you have any mods installed? With a default installation, I cannot see any reason why your character would have those spells (I can't find those spells when using EE Keeper, NearInfinity, or DLTCEP, so my assumption is the reason why EE Keeper cannot find them is because they don't exist).